The young generation of BJJ sportsmen is snapping at elder fighters’ heels! 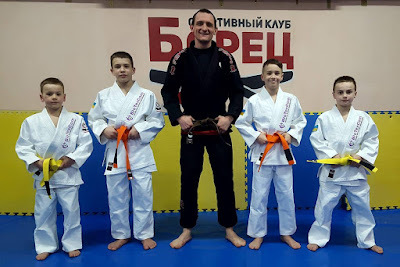 On the photo you can see Kostya Zhyvanov and Nikita Petushynskyi (both 8 years old), Vlad Danchul (11 years old), and Igor Tenenyk (12 years old) stand next to their coach Ievgen Skyrda. Despite such a young age these sportsmen have already shown that they are going to have a great future! Thanks to hard work and self-discipline, exhausting training and total dedication, fighters have earned an incredible 10-day trip to the world championship that will take place in Abu Dhabi. In addition to the fact that they will visit one of the most beautiful cities on the planet, these juniors will experience the spirit of incredible championship and will represent the SC “Borets” / ZR Team Ukraine at the international sports arena. Now young fighters know that a real hard work will be amply rewarded.